Representatives from the Washington Township administration, fire department, ambulance and rescue, police department, as well as members of the Gloucester County Office of Emergency Management, Kennedy Health professionals and more gathered together on Thursday for a suspicious package exercise. Washington Township first responders addressed a suspicious package at Kennedy Health Care Center on Thursday as part of an annual Office of Emergency Management exercise. 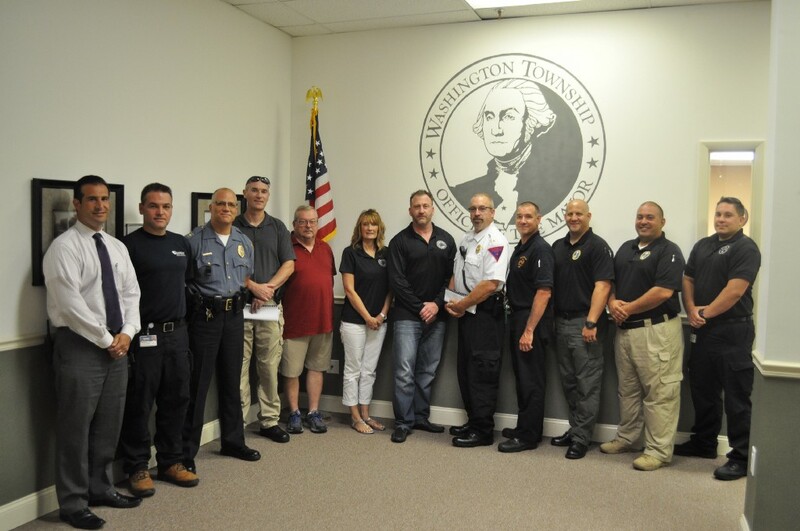 During the drill, the fire department, ambulance and rescue association, as well as Kennedy professionals in collaboration with the Gloucester County OEM and township administration, joined law enforcement officers in the response to a simulated report of a suspicious package. According to Jack DeAngelo, deputy emergency management coordinator at the county’s OEM, the purpose of the drill is to practice skills and plan procedures in case of an emergency, ensuring those responsible for participating are familiar with their roles and the resources utilized in a response. Following the simulation, a meeting is held to review the response and discuss any changes to existing plans if necessary for improvements. Jason Gonter, Washington Township business administrator and senior deputy OEM coordinator, said the full-scale drills are required annually in Washington Township, while the municipality also holds several smaller scale drills throughout the year, as well as Local Emergency Planning Committee meetings to discuss emergency situations. “We make sure to stay prepared for any incident and assist several facilities in Washington Township with their specific OEM plans,” Gonter said. For the recent drill, Washington Township law enforcement was the first on the scene, calling in emergency medical services, fire and county bomb squad for assistance. The respondents would then evacuate residents, while ultimately neutralizing the package, Gonter said. According to Fire Chief Pat Dolgos, incidents such as a suspicious package are a threat to not only the community, but to emergency responders. Dolgos said although the primary function for the response was to provide fire suppression and rescue services as needed, members of the fire department are also specially trained as hazardous material technicians and specialists, as well as emergency medical technicians trained to respond to law enforcement incidents such as mass casualty, active shooter and acts of terrorism, to name a few. Dolgos also said WTFD is one of the primary agencies for the Technical Rescue Task Force, specializing in advanced rescue skills such as a building collapse. While last week’s drill was a full-scale exercise, there are other levels of preparation the township and county perform throughout the year, such as a discussion-based tabletop exercise, or a functional exercise, focusing on communications. Gloucester County Freeholder Giuseppe (Joe) Chila, liaison to emergency response, said throughout the past two years, the county has taken steps toward increasing response capabilities by acquiring additional resources. Improvements and additions have been made in regard to equipment and personnel, while communications and incident management systems have been enhanced.